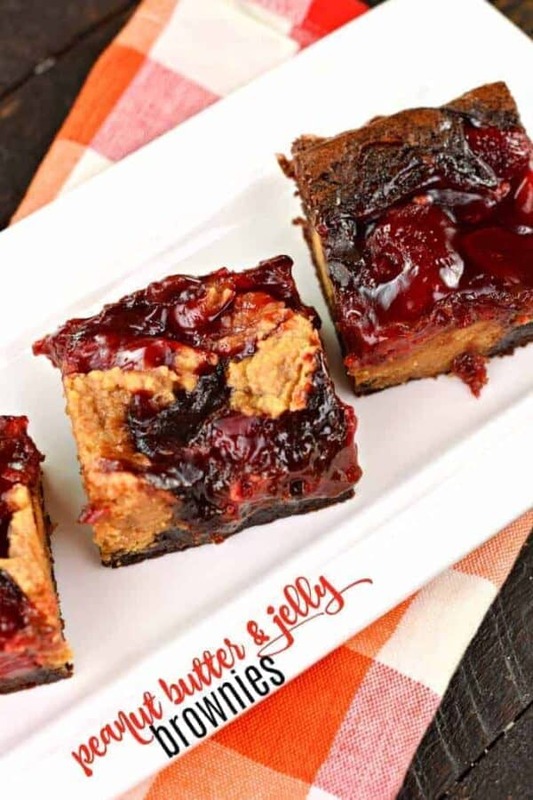 Gooey, decadent Peanut Butter and Jelly Brownies are loved by kids and adults! 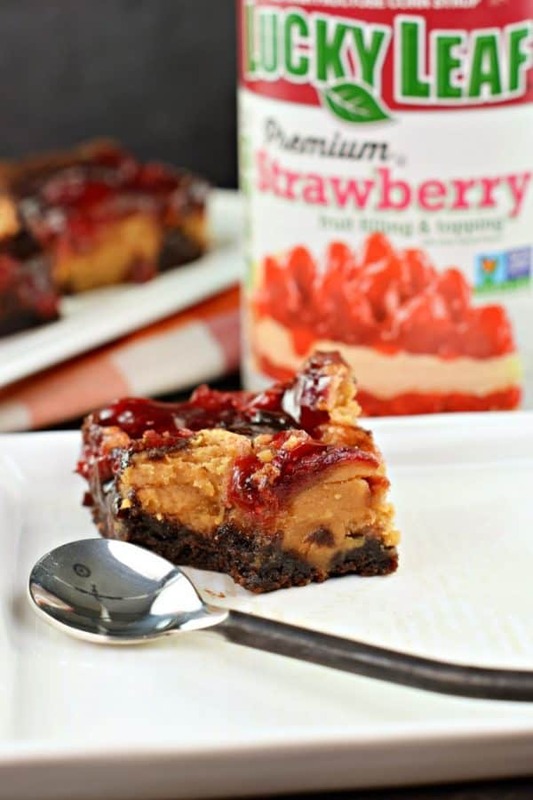 You’ll love the sweet balance of strawberry pie filling with the peanut butter and chocolate brownies!! In our house we LOVE peanut butter and jelly sandwiches. We actually have a scale from 0-10 on how much peanut butter, and how much jelly each person likes on their sandwich. Ten being the most, and 0 being the least. 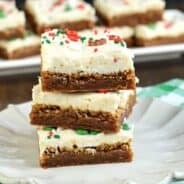 Our love for peanut butter and jelly made me think of these Peanut Butter and Jelly Brownies from the Lucky Leaf website. 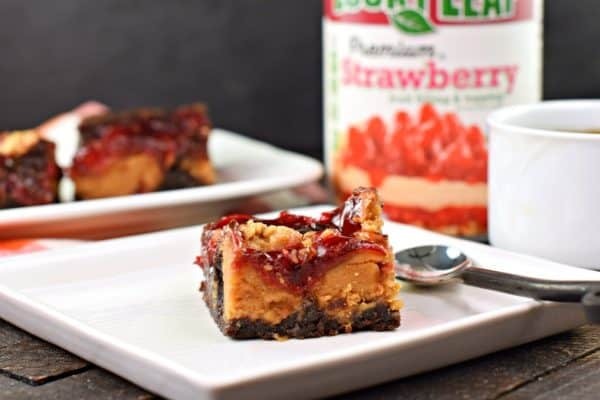 However, instead of using a jelly, these brownies call for an entire can of Strawberry Pie Filling. Don’t worry though, there’s plenty of peanut butter and chocolate brownie to balance the pie filling! While a photo of these brownies don’t do them justice, you’ve got to trust me on this….THEY ARE AMAZING!!!! I love using Lucky Leaf Pie Filling in my recipes, as I find that it’s thicker (not runny) and the chunks of fruit are fresh and colorful! I use it all the time when making my Peach Hand Pies and my Strawberry Hand Pies! What’s YOUR favorite way to use pie filling? Recently, Lucky Leaf has created a FREE ebook filled with 20 incredibly delicious recipes using pie filling! Check it out here! And if you missed the past ebooks, be sure to take a peek into those as well by visiting their website! Did I mention they are FREE? You’ll see my Peach Pie Bars made it into the ebook as well. 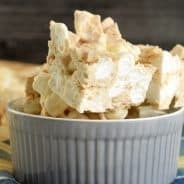 They’re so good, just don’t forget the scoop of ice cream on top! I made a quick video tutorial to show you just how easy these Peanut Butter and Jelly Brownies are to make at home! Enjoy! 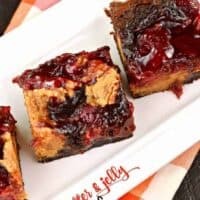 Gooey, decadent Peanut Butter and Jelly Brownies are loved by kids and adults! 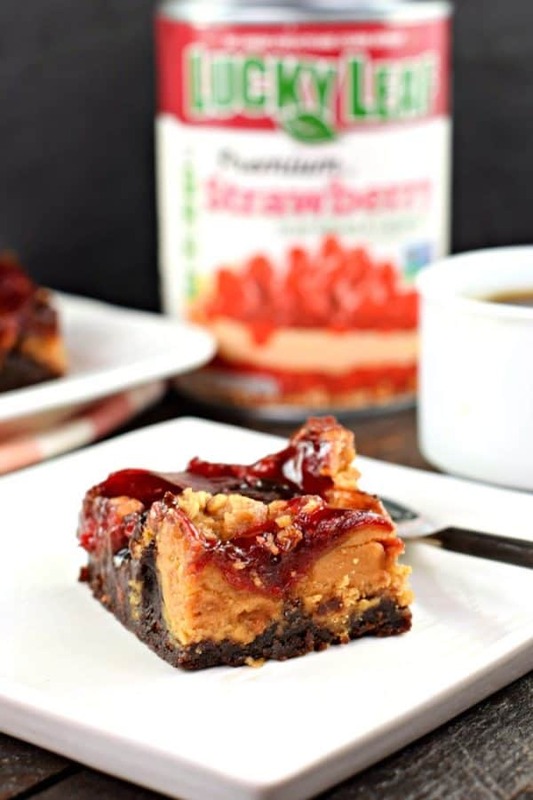 You'll love the sweet balance of strawberry pie filling with the peanut butter and chocolate brownies!! Preheat oven to 350°. Line a 9 X 13 pan with foil, then spay with baking spray. Set aside. In a large mixing bowl, combine brownie mix, 2 eggs, oil and water; spread into the bottom of the prepared pan. Set aside. In a medium bowl, soften peanut butter in microwave for 30 seconds. Add in sugar and 1 egg; combine well. Drop by spoonfuls over brownie batter. Spread fruit filling over peanut butter batter. With a butter knife, twirl the layers in equal sections, repeating the process throughout the pan; you should be able to see all three layers as you twirl with the knife. Bake for 30-33 minutes; cool completely and refrigerate. 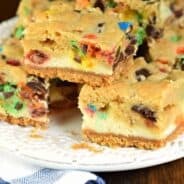 Cut into squares and enjoy. Ah, pb&j take me back to the lunchbox days. Such a simple and delicious sandwich. Never reimagined them into brownies though. I’ll have to give these a try. I am allergic to strawberries and am wondering if raspberry jam or maybe blueberry pie filling would work? Perfect combination of peanut butter and fruits. Great creation ! Thank you ! had to comment since I’ve never seen this combination before, thank you for sharing it! Don’t make a lot of sweets but this one will do, had never heard of using strawberry pie filling, seems like an even better fit for baking, so thank you again!